Does the Remuneration Tribunal need to give a pay rise? No. Under the Remuneration Tribunal Act 1995 the Tribunal is not required to increase any element of a public official’s remuneration. There may be a good reason not to award a pay rise. For example if the number of members on a board increases without an increase in work load, it may not be appropriate to determine an increase in remuneration for board members. Does the Remuneration Tribunal make the same decision every year? No. Each time the Tribunal sits to consider what salary, allowances or entitlements to determine, it makes a new decision after looking at all of the available information. This information includes the local and national economic climate, the remuneration received by other similar public offices in other places and the nature of the work being performed by the public office. Because this information changes, and these factors interact differently over time, each decision by the Tribunal is different. 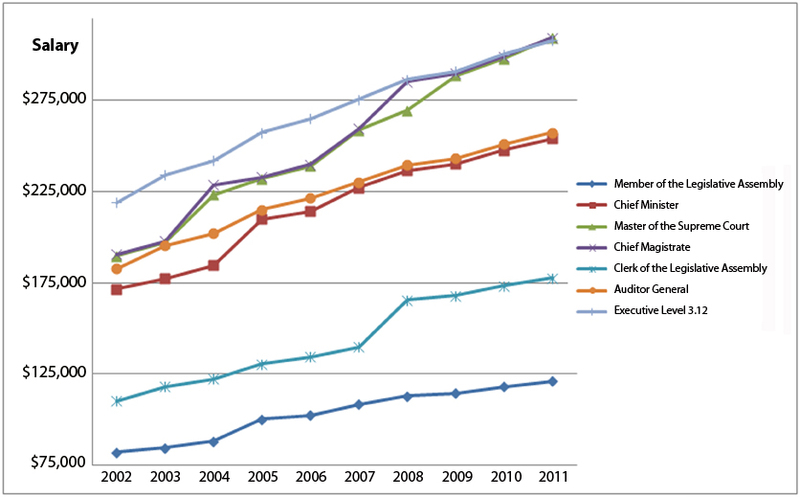 This graph shows the salary for a sample selection of public officials over 10 years. You can see that for each office the Tribunal makes new decisions every year, and that the Tribunal considers each office separately. Can the Remuneration Tribunal change the way an office is remunerated? Yes. Although the Tribunal considers the history of an office’s remuneration, it is not bound to continue to remunerate an office in the same way. A change to the way an office is remunerated would usually only happen if there is a change in circumstances, for example a public office changes between full time and part time or an entitlement is made available to an office through another means and the Tribunal wants to avoid ‘double dipping’. The Tribunal can make new determinations at any time, and does not need to wait a full year before it makes changes to the way an office is remunerated. Can the Government reject or change a determination? No, the Remuneration Tribunal is independent of Government. Under the Remuneration Tribunal Act 1995 , when the Tribunal makes a determination it cannot be rejected or changed by the Government. Although the Tribunal will always consider a submission made by the Government, the Government has no power under the law to reject or change a determination about either their own remuneration or the remuneration or other public officials. Does the Remuneration Tribunal set its own salary? No. The Chief Minister determines the Remuneration Tribunal’s remuneration. When the Chief Minister makes this determination it must be notified, and presented to the Legislative Assembly.